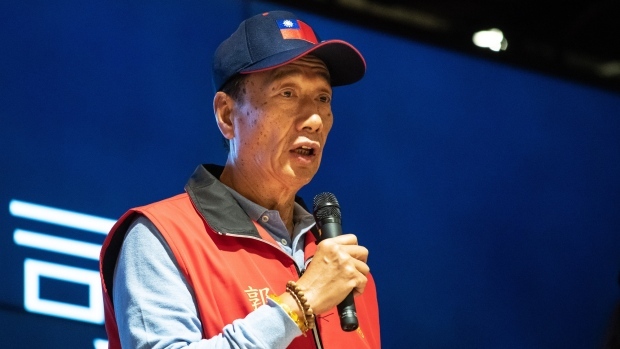 (Bloomberg) -- Foxconn founder Terry Gou said he was considering seeking the nomination of Taiwan’s opposition Kuomintang to run for the island’s presidency. Gou said on the sidelines of a security forum Tuesday in Taipei that he was mulling a bid to challenge President Tsai Ing-wen, who’s facing an uphill reelection fight. The event was hosted by the American Institute in Taiwan, the U.S.’s de facto embassy, and Taiwan’s foreign ministry. “If I am to make a decision, I will participate in the KMT primary,” Gou said, adding he would make a decision as soon as possible. The opposition party is expected to select a candidate in the coming months to run in next year’s elections. Tsai is also facing a challenge for the ruling Democratic Progressive Party’s nomination by former Premier William Lai. Gou’s resources could help him stand out among a field of potential challengers, including former New Taipei City Mayor Eric Chu and Kaohsiung Mayor Han Kuo-yu. He’s the founder and chairman of Foxconn Technology Group, which became the world’s biggest contract manufacturer of electronics as the main production partner for Apple Inc., assembling iPhones. While he founded his business in Taiwan, Gou was among the first foreign business leaders to put plants in China to tap the mainland’s cheaper wages and land costs and able to bring products quickly to market.